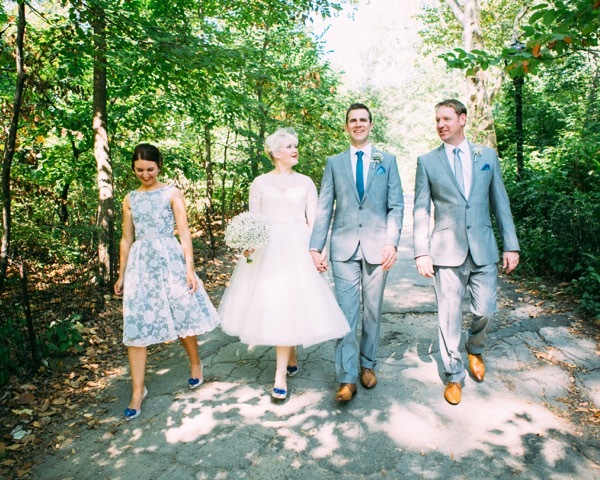 Emily and Lee brought their family and friends from Northumberland in the UK to New York this September for their wedding in Central Park. They met as teenagers and have been together for eight years. Lee has his own plumbing and heating business and Emily is a Speech and Language Therapist. Emily graduated from university in 2013, and the couple came to New York then as a celebratory trip. That is when Lee popped the question one day in Central Park and they got engaged. 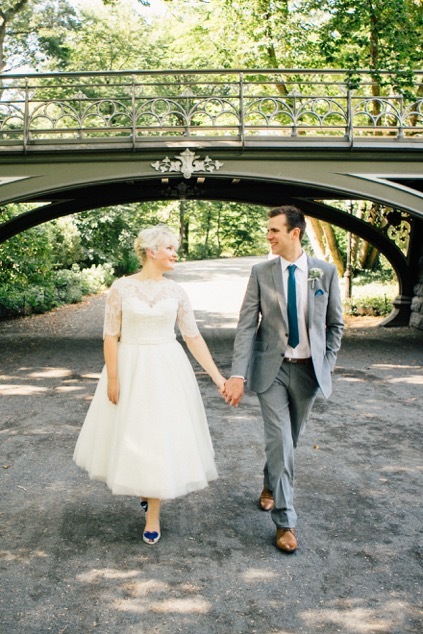 They knew that they wanted an outdoors wedding and they had considered getting married in England but they were nervous about relying on the unpredictable English weather. So, they they talked about going back to the city where they got engaged, and once they started talking about New York, they knew that Central Park was the place for them. The couple still worried a little about the weather, as everyone does when planning a wedding outdoors, and this is a worry that is especially common among the British couples I work with. They chose September because they were hoping that it would not be too hot or too cold, and it was just right for them. Although this year it was unseasonably hot at the beginning of the month, so New York weather is a little unpredictable, too. Emily and Lee stayed in the Hilton Homewood Suites, Manhattan for seven days. Emily said that the rooms were bigger than most in Manhattan, which certainly helped when they were getting ready. 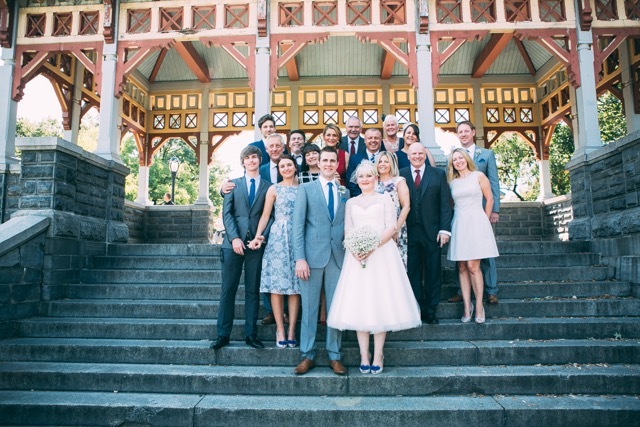 Fifteen close family members and friends came from the UK to the wedding. Emily said that she thought they were apprehensive about travelling to the US for the wedding at first but in the end everybody said they had a great day and liked that it did not follow the usual traditions of a wedding in the UK. 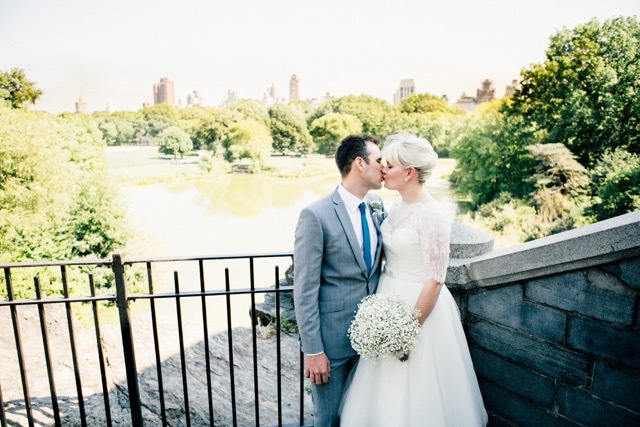 Their wedding ceremony was held on Belvedere Castle Terrace. They chose this location because it offered shade if it was hot and cover if it was raining. It is also the highest point in Central Park so the views of the Park and city made for great pictures. They decided to go with their own photographer, rather than have me book one for them, their photographer was Laura Ryan Photography. Vanessa was their photographer on the day and they would highly recommend them. They had photos taken throughout the Park, mostly on the route from the Castle to the East side, taking in the Reservoir, some of Central Park’s loveliest wrought iron bridges, and then out by the Met Museum. The bride wore a tea length wedding dress with an open full lace back from House of Mooshki, a UK based bespoke wedding dress designer. The shoes the bride and the bridesmaid wore were vintage Vivienne Westwood. The groom and best man wore Ben Sherman suits. The bride’s bouquet and the button holes were gypsophila and were from Rachel Cho in Manhattan. Emily has a close friend who is a hairdresser, she was a guest at the wedding, and she did the mother of the bride, the bridesmaid and the bride’s hair and the bride’s make up. 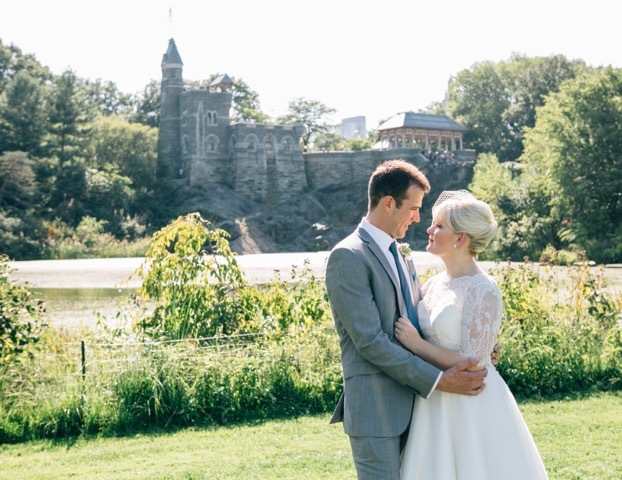 After the wedding ceremony, the couple laid on a picnic for their guests on the banks of Turtle Pond, right by Belvedere Castle. 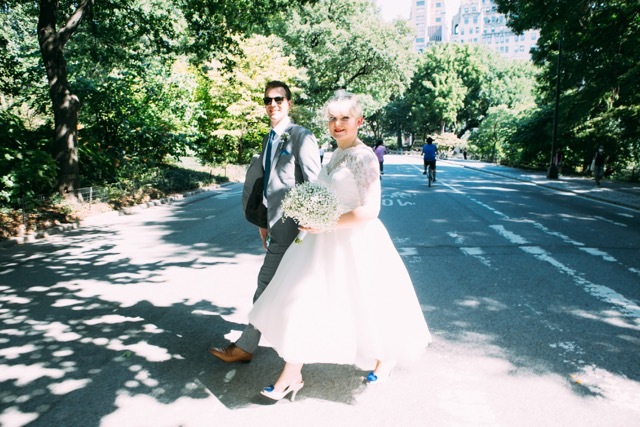 While they enjoyed that the bride and groom were whisked off for photos around Central Park. Later that evening they all went for a meal at Rare Bar and Grill on Lexington Avenue. They said that they would highly recommend this restaurant, “the steaks are amazing and the restaurant has a rooftop bar, so we hired an area up on the rooftop and paid for an open bar for our guests to enjoy drinks all evening,” said Emily. 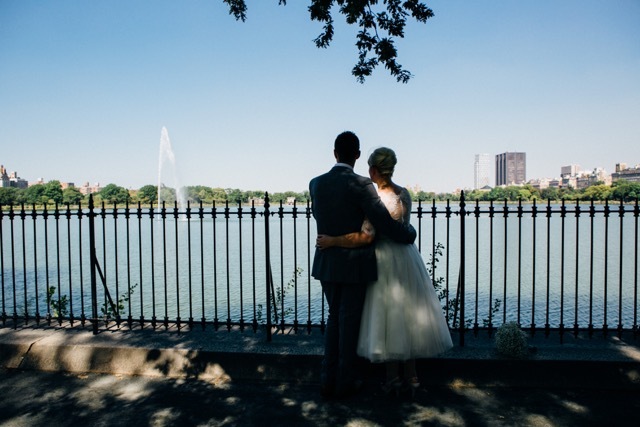 “We had great views of The Empire State Building, The Chrysler Building and The Freedom Tower! We would highly recommend a visit,” she said. 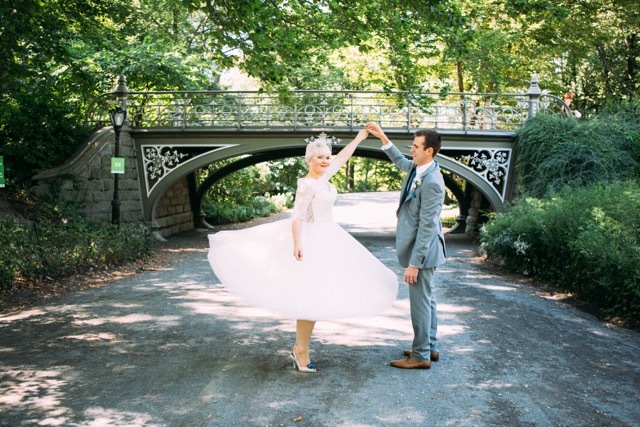 “Getting married in Central Park was the best decision we made,” said Emily. “Although it is a very public place, it felt so private during the ceremony.” This is something that I often notice at weddings in Central Park; once the ceremony gets started the couple only see each other and their party, so it doesn’t matter that a few passers by might stop and watch. 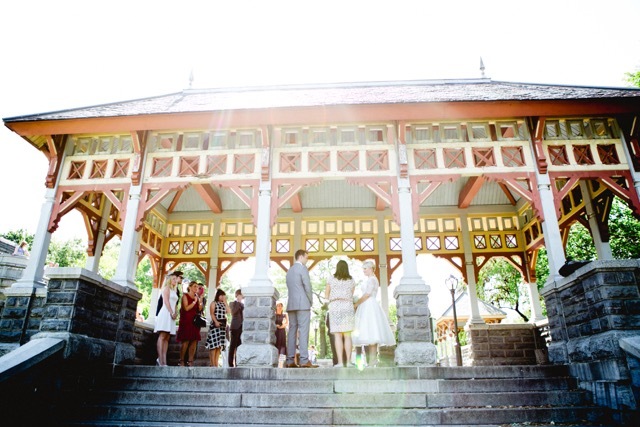 Also, everyone is respectful of a wedding in Central Park, and people do not interrupt. “Everybody we saw whilst walking around Central Park taking pictures was so friendly and they all congratulated us and made us feel so special,” said Emily. 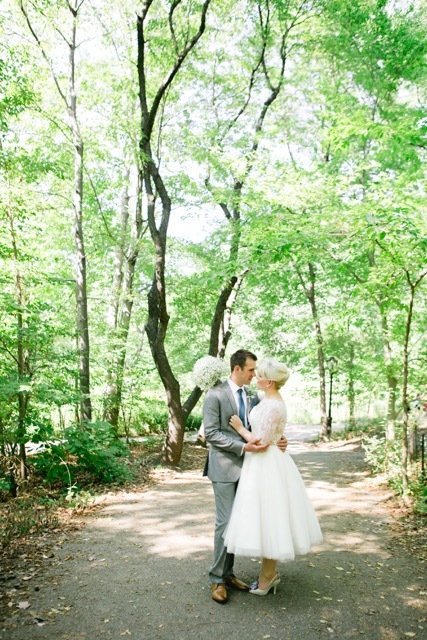 “Claire made the whole process of marrying in Central Park so easy,” said Emily. “She was super quick at responding to emails and was able to answer any questions or concerns I had, even on the morning of the wedding! We couldn’t have done it without your help Claire, thank you!” she said. Thank you for sharing your story with us, Emily and Lee, I wish you the best of luck for your futures together in your new house. This entry was posted in Central Park, New York, real wedding, Weddings and tagged Autumn wedding, Belvedere Castle, Central Park, Central Park wedding, destination wedding, Manhattan, movie quotes, New York City, nyc, quotes, restaurants, Susan Sarandon, weather, wedding dress, wedding location, wedding photographer, wedding planner, Weddings. Bookmark the permalink.